CiSheng Temple, in the DaDaoCheng area in DaTong District. 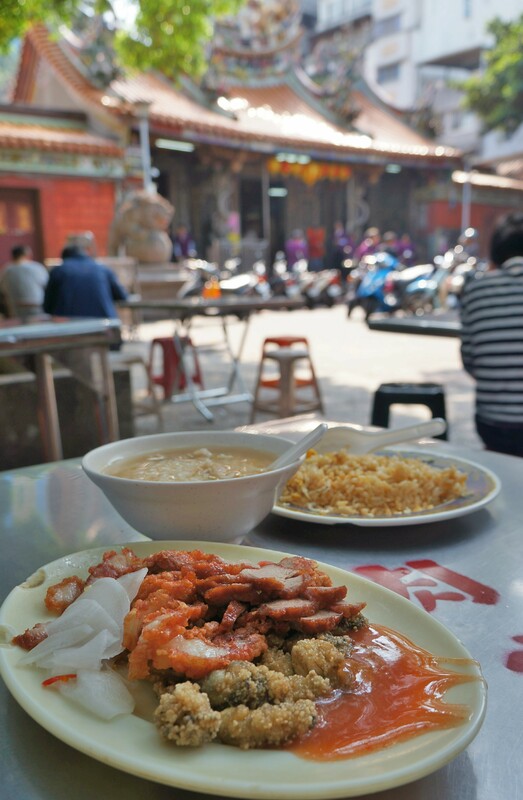 It’s a special temple, in the center of the concrete jungle, streets lined with delicious eateries. Come here for breakfast, and you’ll thank me. This is one of those moments were the less I say about this food, the better. When you try it, you will just know. Basically what you do is you order your dish from the stall and find a seat at the back. There are several vendors, so if you wave to them when they are walking around with a plate for you, they’ll know where to drop off the food. We ordered the 魩仔魚炒飯 mò zǐ yú chǎo fàn whitebait fried rice, from this vendor. Whitebait is a term given to immature fish. There’s a whole host of different kinds of whitebait, but this one is popular in Taiwan to have with fried rice. We didn’t order anything from here, but I will be back to try their 魯肉飯 lǔ ròu fàn which is the stewed pork gravy ladled over rice, and 原汁排骨湯 yuán zhī pái gǔ tāng which is their signature pork rib soup. Half a squid here is going to cost you $200, whilst a full one will cost you $400. This vendor was where we got most of our food from, though. And wow, was it good. We got the fried oysters 蚵仔炸 pronounced “or ah za” ($60), red braised belly pork 紅燒肉 hóng shāo ròu ($60) and also a bowl of the congee 肉粥 ròu zhōu at $25. I hate these little fish, normally, but here I scoffed the plate in seconds. It was one of the best fried rice dishes I have ever had the pleasure of stuffing my face into. Each grain of rice was perfectly separated from the other, no oil in sight, a pop of fresh fish with each mouthful accompanied by the egg. The flavour was light, yet fresh, carrying bags of energy. Asians love their congee, that much is evident if you ever go to a hotel breakfast buffet anywhere on the island. But, this isn’t like the gloop you often see get slopped around at those. This was delicately flavoured broth accompanying perfectly cooked rice, with tonnes of strong meat flavour. Another triumph. One to definitely break any congee hater out there. Let’s start with this pork. Fat, meat, fat, meat, fat, meat. Those are the layers within each slice. Damn. Crunchy on the outside, perfectly cooked on the inside, salty, sweet, fatty, deep flavoured. Yep, all of that and more. And those fried crispy skinned oysters popped with oyster flavour when you bit into them. Paired with some of that chilli sauce they hit the spot. A table spread can’t look much better than this, aside from perhaps a beer nestled in that space between the rice and the congee. But, even I have my limits, it was 08:00. I cannot recommend this place enough.